Bodyguard T260P Treadmill (2012) is first of our 'imagine compatible' treadmills that partners state-of-the-art programming with a proven drive system and our original 20” x 60” X-Frame. 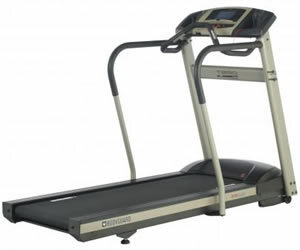 This residential treadmill is driven by a 2.75 HP motor, having a maximum speed limit of 17.7 kmph. Adjustable Pivoting Feet provides an improved leveling on uneven floors while maximizing stability when on an incline. Readouts (Designated) Calories, Calories per Hour, Distance, Elapsed Time, Goal %, Heart Rate, Incline, Maximum Heart Rate %, Speed, Target BPM. Readouts (Scrolling) Value Remaining (Time, Distance, Calories), Value Segment (Time, Distance, Calories), Elevation Change, METS, Pace, Time in Zone. Readouts (Summary) Average Speed, Calories Burned, Total Elevation Change, Total Time in Zone, Total Distance, Total Exercise Time. ToughTrain 4 out of 5 Have very good features but is costly compared with other brands having same features. TreadmillDoctor.com 7.54 out of 10 If you are looking at this one go see what Precor is selling at $1999 and you'll make the smart decision. *Note: Most of the sites, stores or shopping portals listed above sell Bodyguard T260P Treadmill (2012) with discounts and other exciting offers. There is a possibility that the some of above websites are not selling Bodyguard T260P Treadmill (2012) now. Toughtrain.com is not liable for such cases or instances. Also we do not recommend any seller for Bodyguard T260P Treadmill (2012) and a buyer should buy from where he/she gets best deal with quality of products, service and on time delivery (shipment).